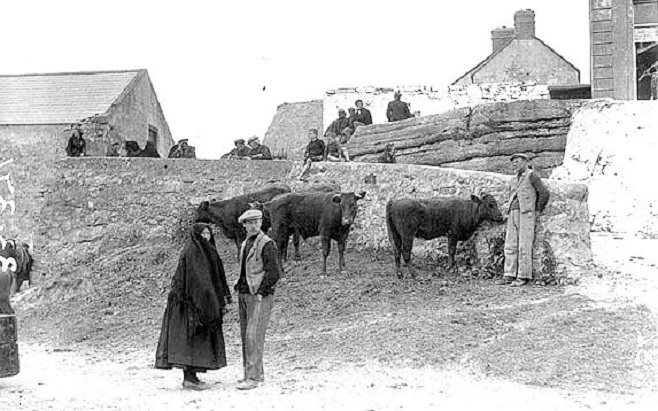 These two fascinating folklore accounts from Co. Galway detail a practice known as ‘churching the cow’. It was carried out immediately after calving and was believed to protect the cow from harm or evil. The name of the ritual, ‘churching‘, is taking from a contemporary religious rite that was carried out after childbirth. Long ago the people used to tie a red rag around the cow’s tail after calving so that the fairies would not bring the cow and then they would shake holy water on her. Then they would get a lightening blessed candle and a girl would stand on one side of the cow and a man on the other side and the girl would hand a candle under the cow to the man and then the man would bring the candle around the cow so they used to do that to bless the cow. Two people get a red coal. One of them stands at each side of the cow and they pass the coal around the cow three times in the name of the Father, Son and Holy Ghost. Then they pass the coal from the hind legs to her head in the name of the Father, Son Holy Ghost. These two accounts form part of the Schools’ Folklore Collection, a large and important corpus of material, whose compilation occurred between 1937 and 1939. This far-sighted scheme, run by the Irish Folklore Commission, saw over 100,000 schoolchildren collecting local folklore from their parents, grandparents and older members of the community.